Totalfear: Total Fear at the Underground Overkill! Total Fear at the Underground Overkill! 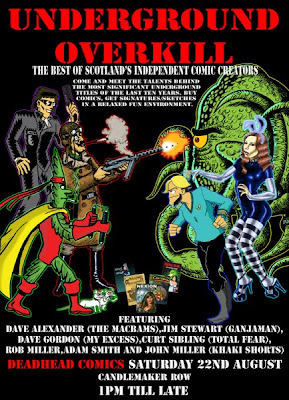 On the 22nd of August 2009 there shall be a gathering of Scottish underground cartoonists at Deadhead Comics in Edinburgh. Many indie publishers and artists will be there, along with their latest comic offerings! Don't miss it! Guests include the following creative powerhouses! Come along and support the new comics underground! Details can be found here at the Scottish Cartoonists Society!